Preheat oven to 350°F. Line two 24-cup mini cupcake tins with baking cups and set aside. In a medium bowl, whisk together flour, baking powder, baking soda, ground cinnamon and salt. Set aside. In a large bowl with a hand mixer or in the bowl of a stand mixer fixed with paddle attachment, cream together butter and sugar until light and fluffy, about 2 minutes. Add eggs one at a time, beating on low and scraping down sides of bowl after each addition, until well combined. Add sweet potato and vanilla and stir. Add flour mixture and stir until well combined. Spoon batter evenly into baking cups and bake 12-15 minutes or until tops of cupcakes are golden brown and spring back when lightly touched. Remove from oven and allow to cool in tins for 2 minutes. Remove from tins and cool completely on a cooling rack, about 30 minutes. Meanwhile, stir together frosting and brown sugar and spoon into a piping bag. Pipe frosting onto cooled cupcakes and serve. It goes without saying that many things in miniature form are just cuter. Babies, for example. Teacup pigs. Pretty much any food, from meatloaf to muffins. So it’s no surprise that these Mini Sweet Potato Cupcakes with Brown Sugar-Cream Cheese Frosting (long name, small stature) are drop-dead adorable, too. But these babies are even better because they’re also DELICIOUS. Don’t get all hung up on the sweet potato component of these little guys. In fact, the mashed sweet potato is what really takes the cake. The flavor and texture rendered by the sweet and starchy nature of the vegetable is what makes these itty-bitty bite size cupcakes so moist, dense and rich that you won’t know if your lack of being able to contain yourself is from the cuteness or the taste (probably both). Topped with decadent Betty Crocker cream cheese frosting mixed with brown sugar (oh, for serious), it’s the perfect degree of indulgence. What I love most about these widdle biddy, cutesy woot—OK, I’m done (but the cute overload!) – is that you can pop just one or two of these into your pie hole and it’s just the right amount of sweetness (though no one’s here to judge if you down a few more. Just saying). Plus, you can make enough for a crowd in the same time and with the same amount of effort it takes to make half the amount in regular cupcake size. And, c’mon, these are just more fun to eat. Because they’re ADORABLE. Gah. 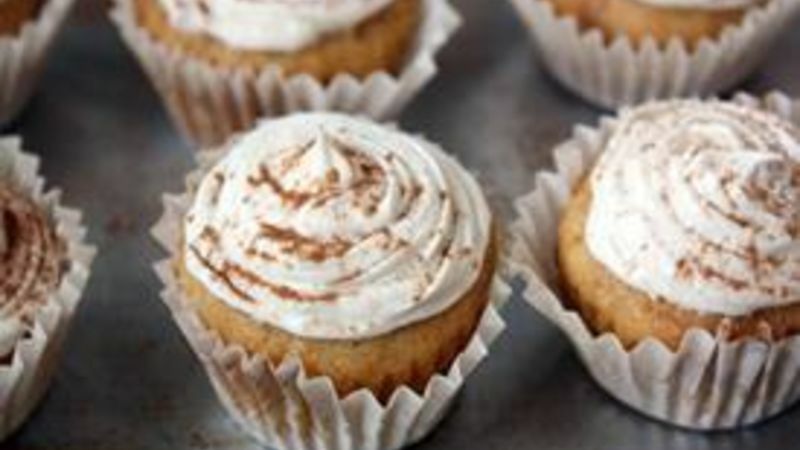 Blame it on the cuteness or on the deliciousness – the way to my heart is a batch of these mini sweet potato cupcakes. And once you try them, it’ll be the way to yours, too.